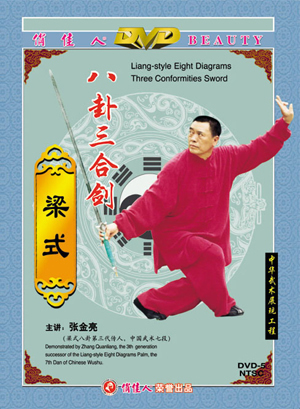 The Eight Diagrams Three Conformities Sword belongs to the internal boxing series. Taking the internal boxing as its origin, it integrates the boxing, Zen and weapon play into one. Based on the Eight Diagrams Palm, it absorbs the effective movements of Taijiquan and Xingyiquan and their weapons. Its movements can be characterized as upright and easy in performance, internal and external conformities in practicing, combining energy and forms, with mind controlling the Qi, the Qi leading the movements, hardness and softness moving in harmony.